My laptop died today. Actually, the hard drive in my laptop did. 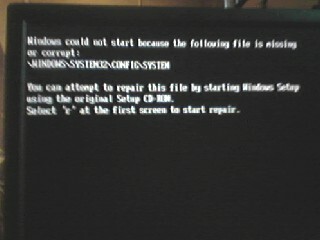 The hard drive encountered some bad sectors, and repairing the OS did not recover it. I was able to backup the drive with Symantec Ghost using the "-fro" switch. The funny thing is that I was thinking of reimaging my drive the day before but opted not too as I have way too many tools, settings, and software to redo. I guess, I'll have to now. Damn! Wow, that's awful. I was wondering whose machine this was when only the photo was here. Bummer. Are you studying?! I got through one whole chapter in book 1. Sloooooow going.